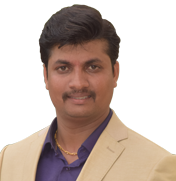 Gurusiddayya completed Bachelors of Computer Application (BCA) from Karnataka University Dharwad, and has more than 3 years' experience in various fields such as marketing, banking and FMCG. Currently, he is a Deputy Manager for LEAD, handling the Hubballi-Dharwad Location. He is very happy in this field because he loves working with youth. His hobbies include creativity, playing sports, travelling, and spending time with friends.